The sensor 1 is fixed in the protective housing 2 using newly developed original cardan suspension 3, which provides vertical position of Z axis when the protective housing is tilted no more than by 8 degrees of arc in any direction. 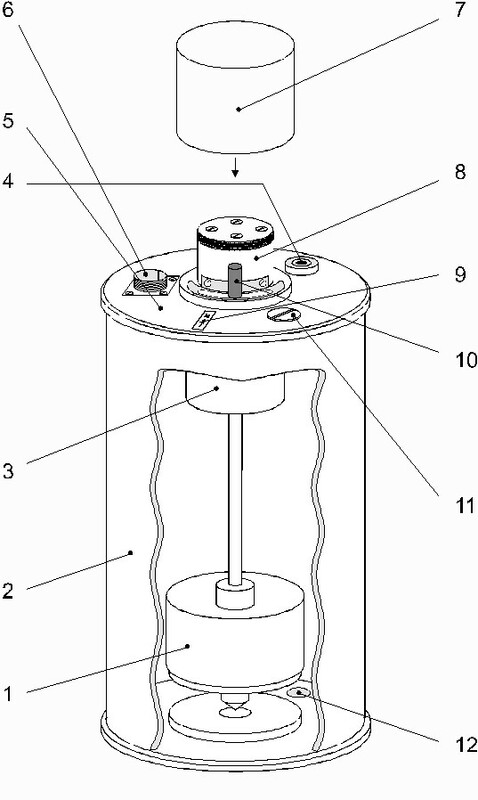 Rough initial housing setting has to be checked using water level 4 on the upper cover 5 of the housing: if the air bulb is in the limits of free floating, the vertical positioning is guaranteed. The connecting cable has to be coupled with the connector 6 on the cover 5. The cardan suspension 3 is developed on the base of four-points conic joints. A pressure surface hardening technology was used which allowed to create the suspension with negligible friction in bearings and good mass center positioning. These joints obligatorily have to be relieved during transportation. That is why the sensor has two positions: operational and transportation. In the last one the cardan itself is blocked, relieved and rigidly fixed inside the housing. In order to transfer the sensor in the operational position it is necessary to turn off the external protective cover 7 on the cover 5 of the housing 2, to lift slightly the cardan mechanism top 8 and to turn it clockwise till arresting. For approximate sensor orientation a north pointing arrow 9 is dashed on the housing cover 5. Exact orientation has to be made as following. Loose special fixating screw 10 near the cardan top 8 and rotate all suspension mechanism. After alignment it has to be fixed back using fixating screw 10. Do not forget to put back protective cover 7! The microoscillations of the ground during the operation are always expected, so an oil dampfer can be used. For this open the plug 11 near the arrow 9 and pour in 0.4 - 0.5 l of silicon oil. Finishing operation, pour out the oil using the plug 12 on the bottom of the sensor housing 2. The housing 1 is weatherproof but it is necessary to avoid total immersion into water together with upper cover 5.